Home > Google News > Google Hot Searches: Any Use For SEOs? Google Hot Searches: Any Use For SEOs? Google announced they have updated hot trends / searches to add images, news stories, the volume of searches and now they also cluster searches together to form a single keyword group. 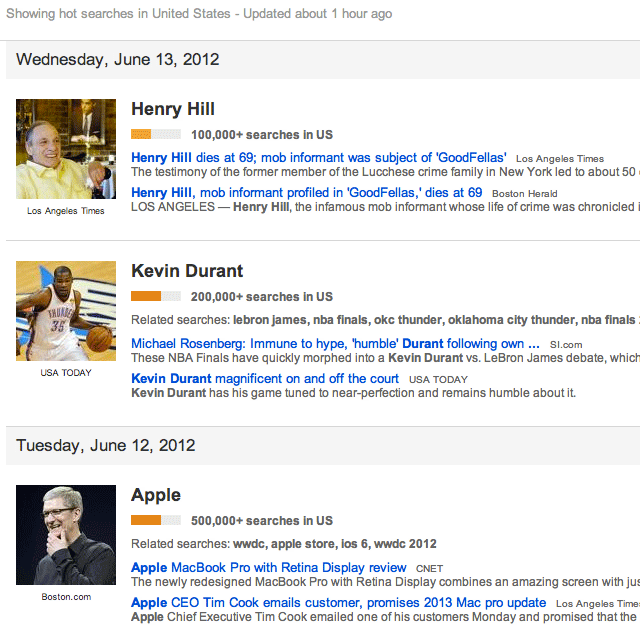 For example, Apple is currently a Hot Search but the related clustered keywords are wwdc, apple store, ios 6, wwdc 2012. I stopped making use of this feature a while ago - except for sites that are chasing the hottest search traffic, I see it as more of a curiosity than a useful feature. So what do you think? A useful tool for SEOs?